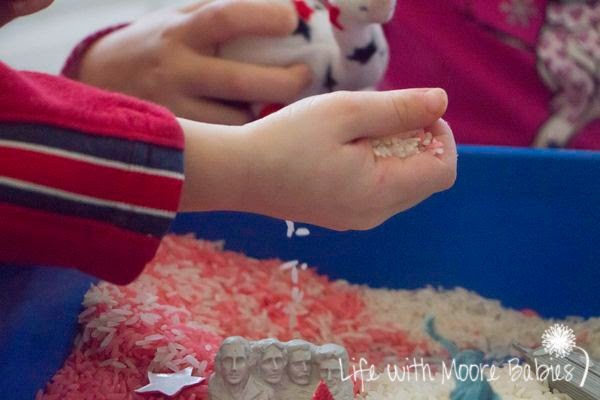 This month's Poppin's Book Nook theme was Presidents. 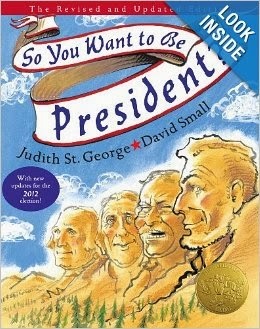 We found a fun book at the library called So You Want to Be President. This book was filled with fun facts about our Presidents pointing out how they were all very different people from different backgrounds. 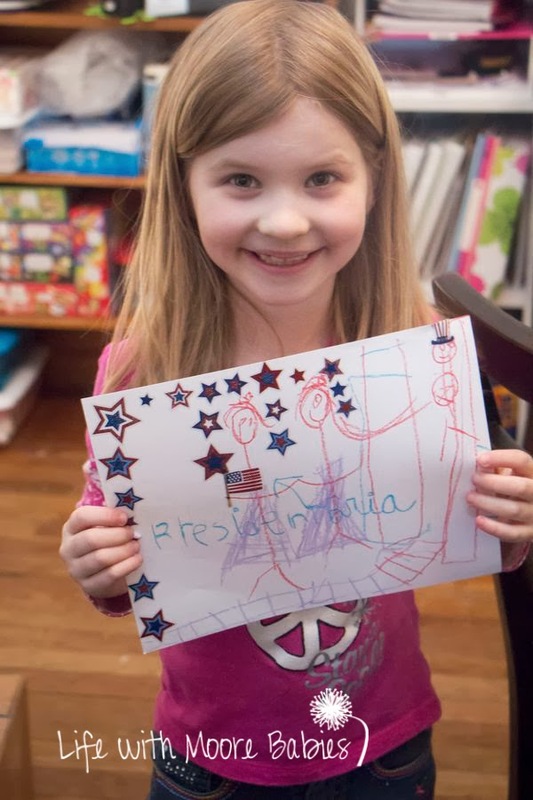 The girls aren't too familiar with all the presidents, so this was a lot of information for them, but it held their interest. I asked them what they thought it would be like to be president, and got the responses of boring and hard, so I am thinking I don't have any future politicians (I am really not sad about this fact, and have to say hat I agree with their assessment). We also talked about the characteristics we thought a president should have. The girls agreed they should be kind and love their country and other people. 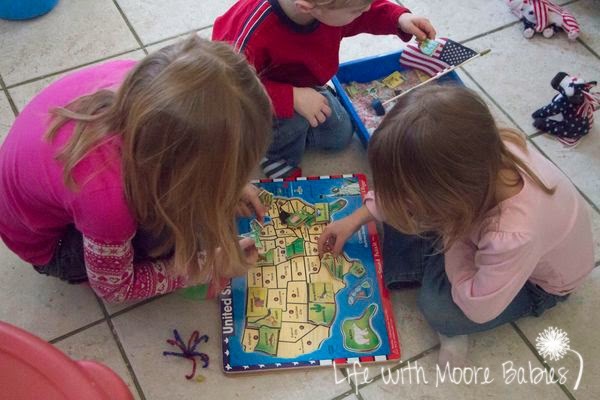 Since a love of the country was a necessity, we learned a little more about our country. We discussed some of the symbols and landmarks. 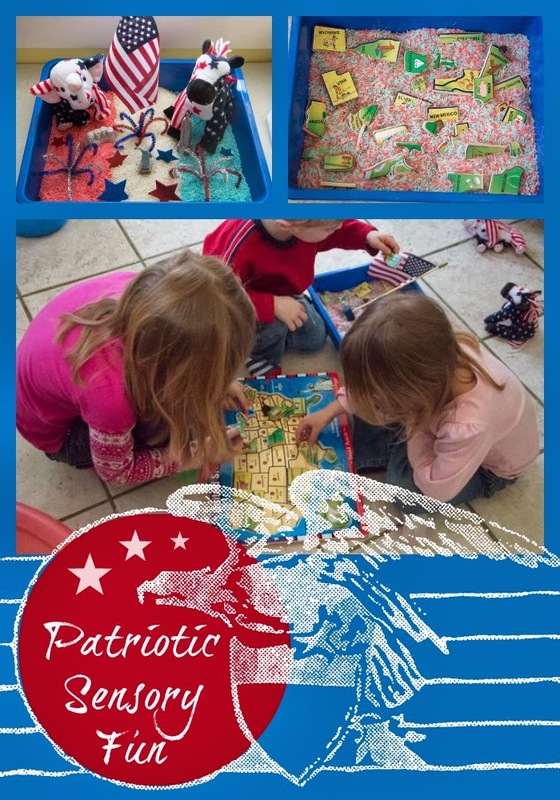 The girls were already familiar with the flag and the bald eagle, but many of the others were new to them. 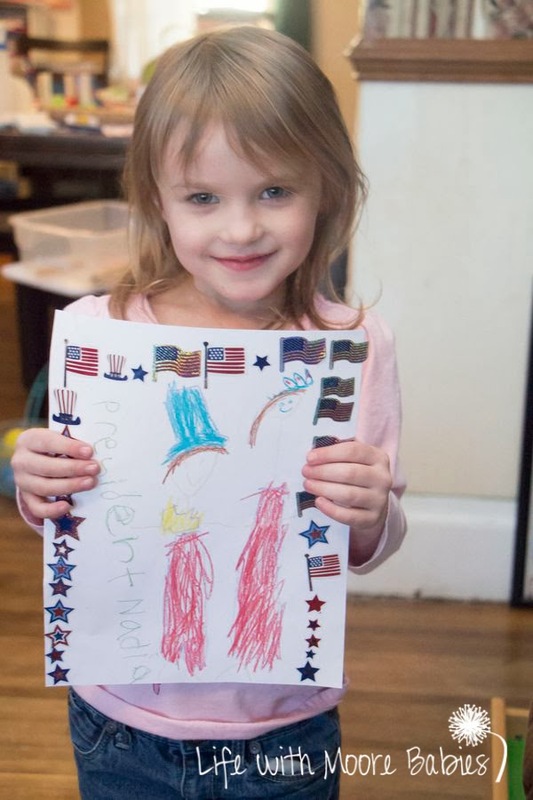 Then they each drew a picture of themselves as president. Purely fictitious since I know at least one of them is standing with Abraham Lincoln and the other has Rapunzel as a vice president. 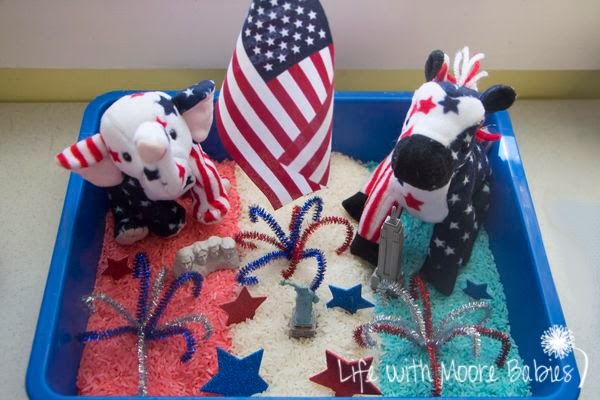 Then the real fun started with a little patriotic sensory bin I set up. 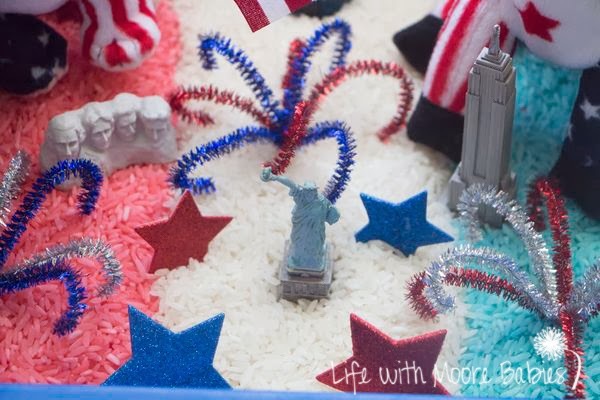 It included red, white and blue rice (which Bria was quick to point out was not arranged like our flag, but looked more like the French flag...sigh), a donkey, an elephant, a little Statue of Liberty, Mount Rushmore, Empire State Building, some sparkly stars, pipe cleaner fireworks, and an American flag of course. 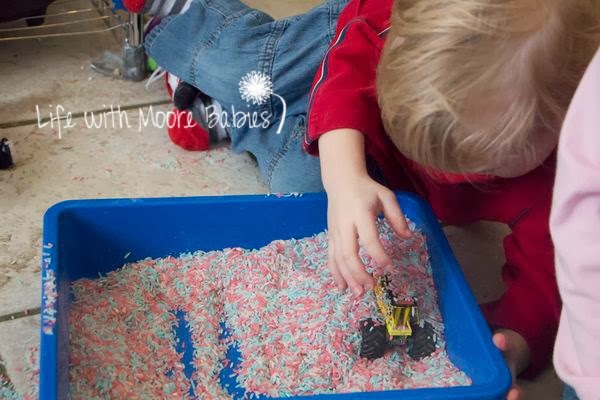 This was mainly set up for Eli, but they all enjoyed playing. In fact the girls pretty much took over with the stuffed animals, and then Eli didn't get to play! 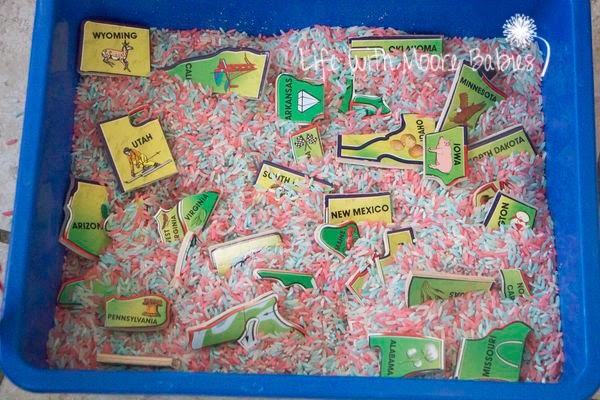 So after a while I took it and added the pieces to our USA puzzle. 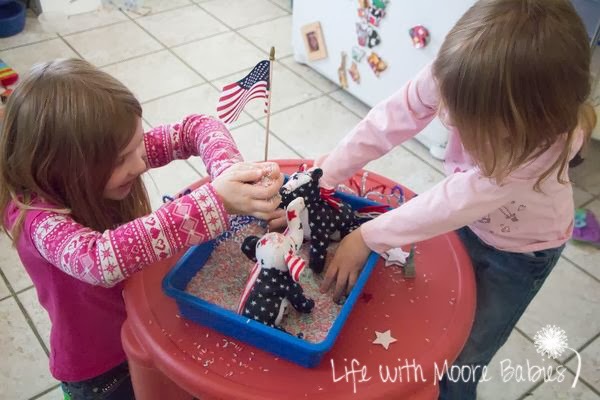 The girls searched for the pieces and fixed the puzzle while Eli played with his monster truck (how much more American can you get) in the rice. 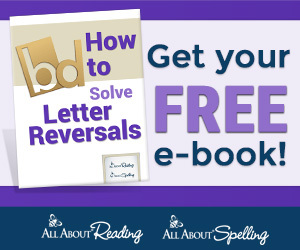 This month we are giving away a copy of the book we read, So You Want to Be President to one of our Poppin's Book Nook readers! This giveaway is only open to residents of the United States! 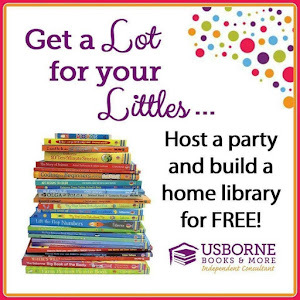 Be sure to stop by and visit the other participating blogs to check out the great books they found as well as the fun projects they did! We'd love to see your Presidential posts too; link them up below!